So we have just two key parameters: the weight ratio, or mass ratio, is just a measure of how much propellant is carried. The characteristic velocity, or the specific impulse, Isp, defines the performance of the propulsion system. 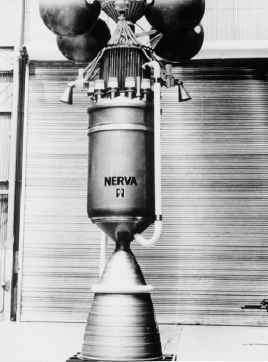 The best cryogenic chemical rockets today have an Isp of 460 s (4,462m/s). That means that a mass flow of one kilogram per second generates 460 kilograms (4,462 newtons) of thrust. If our benchmark change of speed AV is the speed of light (299,790,000 m/s) then the specific impulse required for a mass ratio of 6 is 17,062,060 s. That is, one kilogram per second of propellant flow generates 17,062,060 kilograms of thrust. Or more pointedly, one microgram per second of propellant produces 17.06 kilograms of thrust! That is approaching a so-called "massless" thrust-producing system, and is well beyond our current concept of generating thrust. Even if at some future time an Isp of 100,000 s is achieved, the speed of light (299,790,000 m/s) is 170 times faster the incremental velocity provided by a mass ratio of six. If our benchmark distance is one light-year, or 5,880 billion (5,880 x 109) statute miles, or 1,602 times more distant than Pluto, to reach that distance in a 15-year oneway time the specific impulse of the propulsion system would have to be 1,602 times greater than that of current rockets. If that was so, we could travel 1,602 times farther in the same 15-year time period. That is, the propulsion system Isp must be 1,602 times 300 s (the best Isp feasible with storable propellants), or 480,600 s, or a characteristic velocity of 4,713,000 m/s, about 1.6% of the light speed. The most advanced nuclear electric propulsion we have today is capable of about 4,000 s, just 13.3 times greater than current storable propellant rocket specific impulse, so that we can travel 13.3 times farther in the same 15-year time period, or 48.8 billion statute miles. This enables us to reach the so-called "Oort Cloud'', the origin of long-period comets, and a region of space very distant from any major astronomical object outside of our Solar System. So we are confined to our Solar System if our travel time is going to be the duration of a human project team and our current propulsion systems. At the distance of one light-year and with current storable propellants, the travel time to one light-year distance from Earth is about 24,032 years. That is about the length of human recorded history. With our best nuclear electric propulsion the time to one light-year distance is 1,807 years. Figure 1. 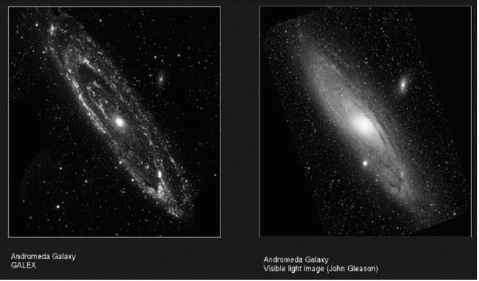 Andromeda Galaxy (from the GALEX/JPL website [irastro.jpl.nasa.gov/GalCen, 2005]).